As if South Louisiana anglers needed another reason to hate ethanol, they’re going to get one this year. 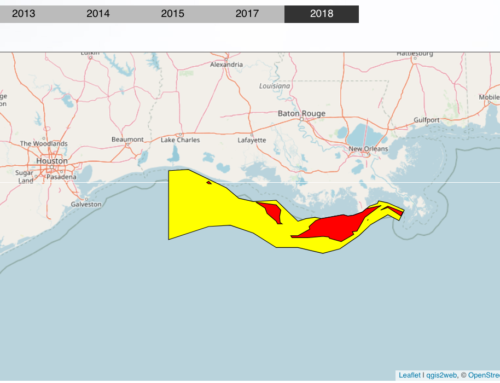 The Gulf of Mexico "dead zone," a swath of low-oxygen water that forms off the Louisiana coast every summer, is supposed to be a record size this year, according to the National Oceanic and Atmospheric Administration. If NOAA’s forecast is accurate, the zone will be triple the size of last year’s, and will stretch from Alabama to South Texas. According to Larry McKinney, executive director of the Harte Research Institute for Gulf of Mexico Studies at Texas A&M University-Corpus Christi, ethanol is the primary culprit. Because of the federal ethanol mandate, the price of corn has rocketed in recent years, and farmers are clearing everything they can to plant the stuff. Corn requires substantial amounts of fertilizer, McKinney explained, and fertilizer contained in run-off is what causes the dead zone. "That whole federal program has expanded greatly the amount of land to which they’re adding fertilizer, which means there’s more fertilizer to run off," he said. When fertilizer that is carried down the Mississippi River reaches the warm waters of the Gulf of Mexico, it feeds massive algae blooms that eventually die and settle to the bottom. As those algae decay, they rob surrounding waters of oxygen, causing areas of hypoxia. Last year’s Gulf of Mexico dead zone was one of the smallest on record at an estimated 2,889 square miles. 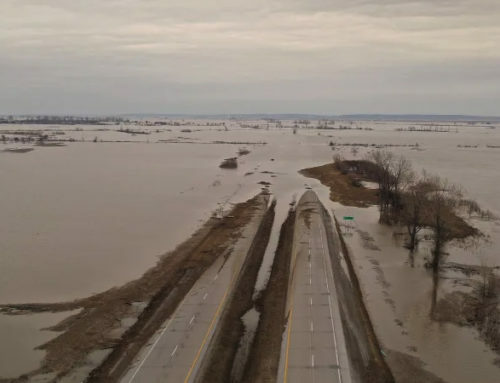 Scientists say that’s because last year’s drought kept the fertilizer in the Midwest, but unfortunately, it simply got more concentrated, and this year’s heavy rains have released it, McKinney said. "In times of drought, all those fertilizers build up because they’re not being diluted, washing away a little at a time," McKinney said. "Farmers add more to it. 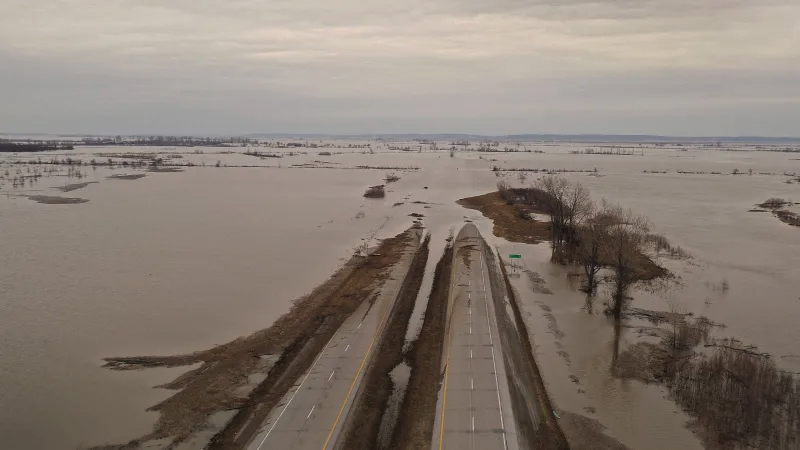 It’s dry, nothing runs off, and then all of a sudden, you have the rains, and all of it runs off, so you get this huge concentration (of fertilizer), much worse than you’d usually see." 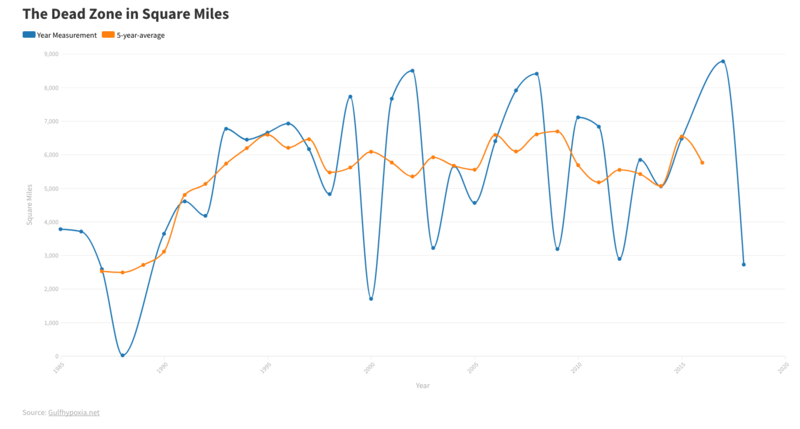 NOAA estimates this year’s dead zone will cover 8,561 square miles. For McKinney, that’s a disturbing prospect for most of the Gulf coast. "This is not just a Louisiana problem," he said. "You guys have been dealing with this for many years off your coast, but as I try to explain to folks, the expansion of this hypoxic zone is not like a balloon that expands on all sides. The currents are going to drive it right into Texas, so if these zones continue to expand — and it looks like they will — we could see times when the entire upper coast of Texas is in these hypoxic zones as well. "That’s not just a tree-hugger issue; it’s real economics." 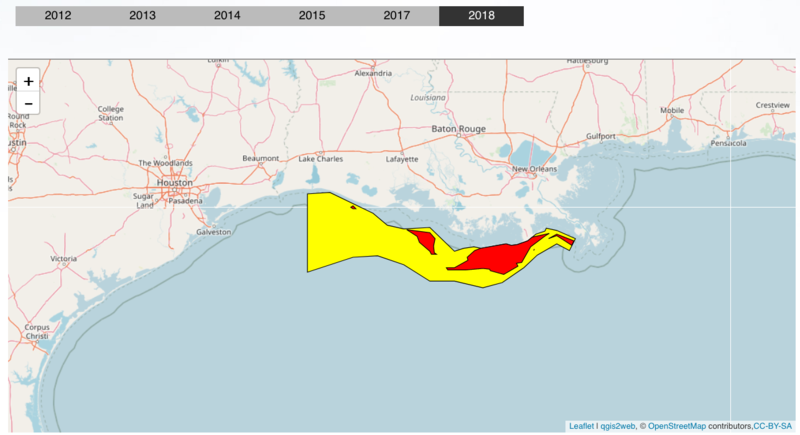 The area expected to be impacted by this summer’s dead zone produces 18 percent of the total commercial seafood sold in the United States, according to Texas A&M University-Corpus Christi. Among commercially harvested sea life, the impacts are most heavily felt by crustacean and bivalve populations, according to Paul Montagna, professor at Texas A&M University-Corpus Christi. "The hypoxia zones are not dangerous to fish, but cannot support bottom-dwelling life such as clams, crabs and shrimp," he said. 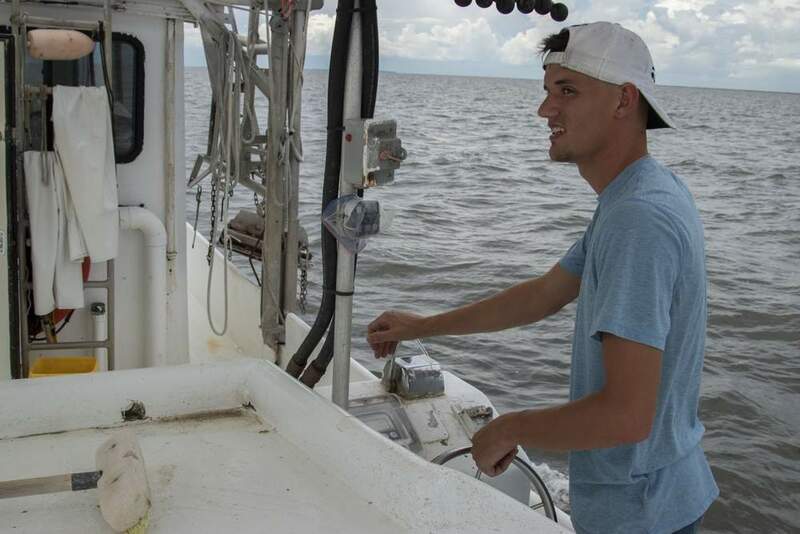 "Because fish avoid these areas, commercial shrimp boats and recreational fishermen must go farther out, to open water, to make their catch." The dead zone has its most profound effect at the bottom of the water column. Fish and baitfish often thrive at higher levels, but the benthic base can be severely impacted. 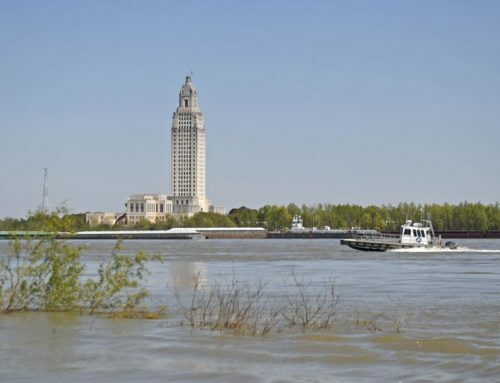 McKinney has seen it firsthand while diving in the dead zone with Louisiana’s resident dead-zone expert, Nancy Rabalais. 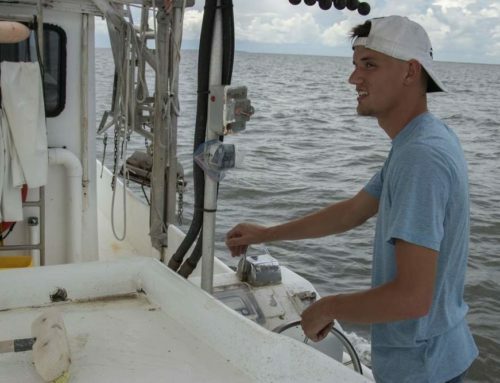 "We were doing work right off the Louisiana coast, and I dove in shallow water — 30 feet or so — and when you get to the bottom, it’s very clear because everything is dead," he said. "The bottom is fairly flat, but any place that there’s any kind of elevation at all — like a piece of tree trunk or part of a shrimp boat — you’ll swim up to it, and there’ll be crabs, worms and shrimp crawling up as high as they can get in the water column. "It’s like when a sailboat goes down and everyone climbs the mast, climbing over one another to get as high as they can. That’s what it looks like because they can’t swim away. The fish have all left. These things sit there and die." 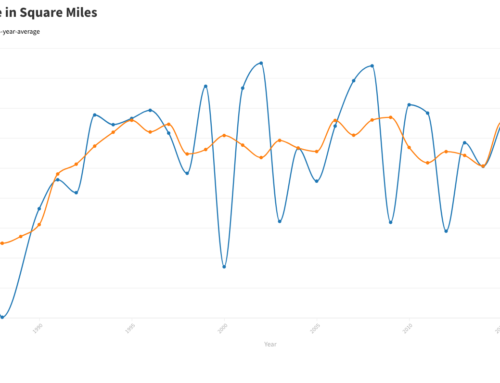 Dead zones peak with the hot temperatures and calm winds of July and August. They usually break up with the cool fronts of autumn or with the passage of tropical storms or hurricanes during the late summer.